Faster than a speeding bullet. Nope. More powerful than a locomotive. Hardly. Able to leap tall buildings in a single bound. Not this car. But if you are looking for some fun behind the wheel, check out this itty bitty Kei car modified by Liberty Walk. It’s not fast, it’s not practical, and it’s not available for purchase outside of Japan. Due to its diminutive size buying one seems more like the impulsive cravings of a child than the calculated horse sense of an adult. But if your necessities include low running costs and easy parking, the S660 could be the best bang you will get in your driving life. In fact, this car makes a lot of sense when you consider its market. 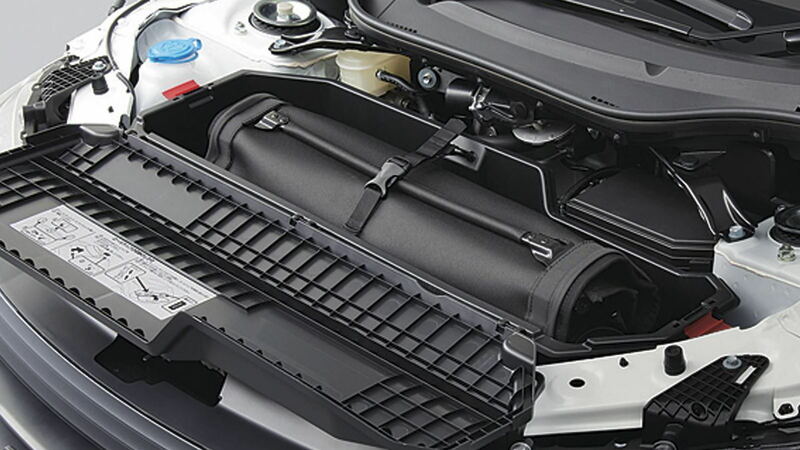 It’s a sensible car that offers the basic necessities to make it affordable, economical (despite its 6.5-gallon capacity) and useful especially when it comes to parking. You’re not going to use it for road trips. You’re not going to use it for your marketing unless you only plan to fill a bag or two. But you will be riding with the wind in your hair and a smile on your face, and if you manage to get your hands on one built by Kato-san of Liberty Walk, you just may be the envy of everyone on your block. 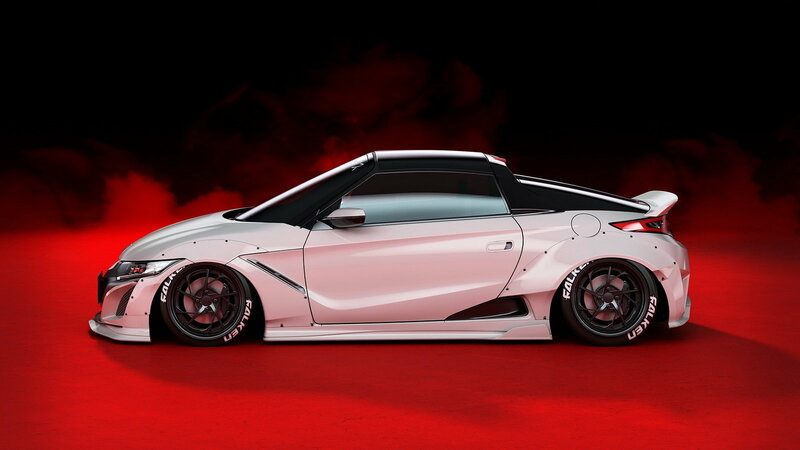 >>Join the conversation about Liberty Walk's SSX-660R right here in S2Ki.com. The Kei car, or K-car, is a type of mini-car designed to comply with Japanese government tax and insurance regulations. History has shown that the traditional kei car (or “Yellow-plate car”) was manufactured post-WW2 when most Japanese could not afford a full-sized car. Through the years the Kei car went from 150cc in 1949 to 360cc in 1955. The first mass-produced Kei cars were the Suzuki (Suzelight) and the Subaru 360, but today manufacturers have been able to introduce many advanced technologies to the class including forced-induction engines, automatic and CV transmissions, front- and rear- and four-wheel drive, a/c, GPS, and so on and so forth. Daihatsu (owned by Toyota) and Suzuki dominated the Kei car market from the late 70’s into the 80’s, and the first of the Kei sports cars was born in right around 1990 with the introduction of the Honda Beat. The S660 was introduced in 2015 and, as mentioned above, it’s a bare-basics mini-car regulated by Japan’s government. Just so you know the rules of the game, Kei cars can’t be longer than 137 inches or wider than 59 inches. They must be powered by a 3-cylinder engine no larger than 660cc, which means they are actually more powerful than their ancestors back in the 1940’s. 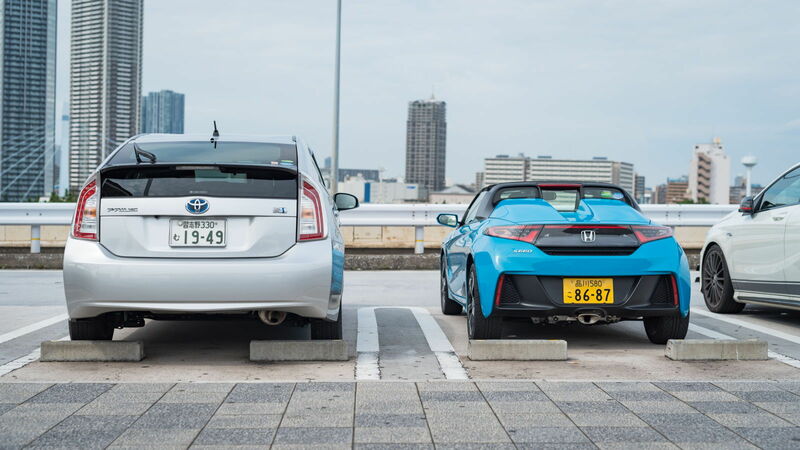 Beyond these simple rules, the rest of the car’s build is completely up to the manufacturer and most of them try to do their best to maximize what little space by dropping tall boxy bodies on top of their chassis. But Honda wasn’t interested in making another sensible k-car. No, they dared to be different, and different they became when they introduced a mid-engined baby roadster that is said to have inspired the newer, faster NSX and Civic Type R. It’s light as a feather, weighing in at about 1,850 lbs and offers a very regulated 64 hp and 76 lb-ft of torque. You have your choice of six-speed manual transmission a CVT with paddle shifters. Top speed is about 87 mph. 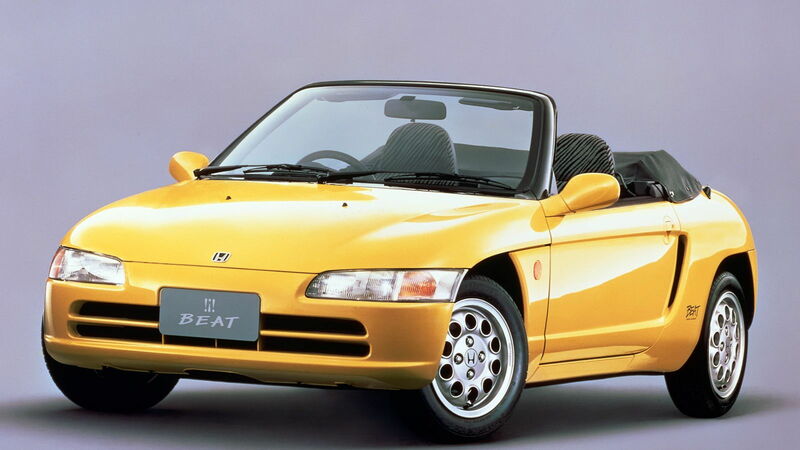 What makes this car different than its predecessor, the Honda Beat, is that it’s more Targa top than full-convertible. The removable soft top can be stored in the “frunk.” But what makes it even more unique is the treatment it has received from innovative car designer Wataru Kato, the innovative president of the Liberty Walk tuning company of Nagoya, Japan. “I like to build cars that make people happy,” says Wataru Kato, head of Liberty Walk. 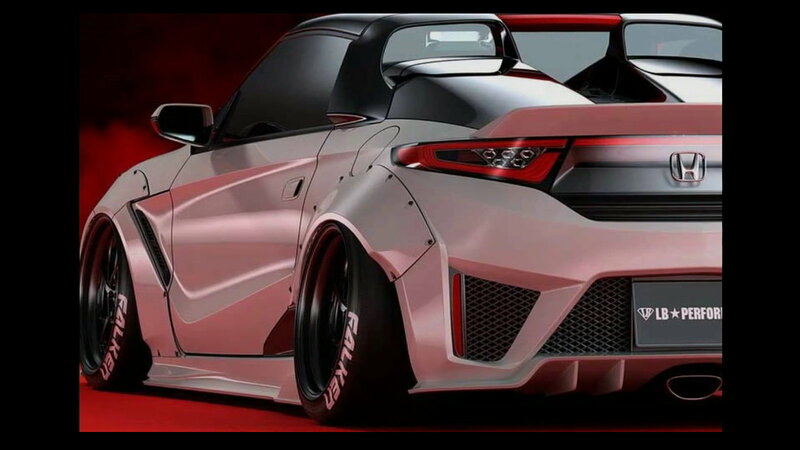 That is exactly what Kato-san of Liberty Walk did when he transformed the S660 into a smaller version of the LB Performance NSX, borrowing design elements from Honda’s latest supercar while incorporating his own aesthetics into the build. 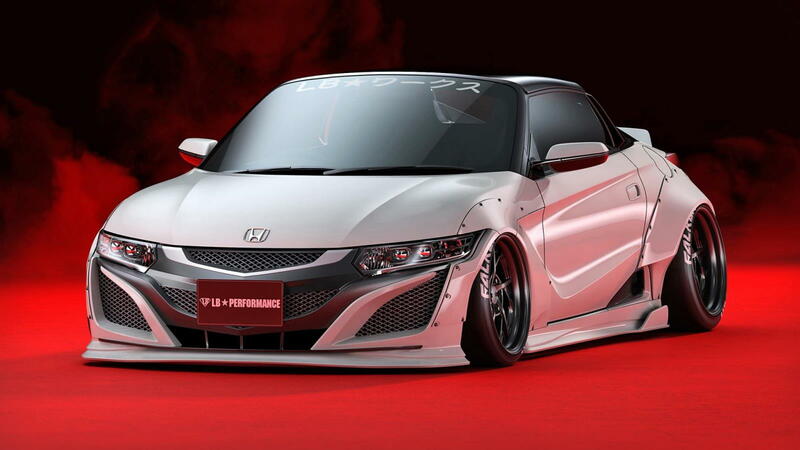 Most obviously, the completely redesigned front bumper, which gives the car a baby NSX look. Kato also gave the Kei car FRP side skirts and, rather predictably, over-fenders. Liberty Walk widened fenders always add extra aggressive, but with the LB Works SSX-660R, they almost look cute, like someone tried to soup up their 6-year old’s Ride On Car to be the hottest one on the block. 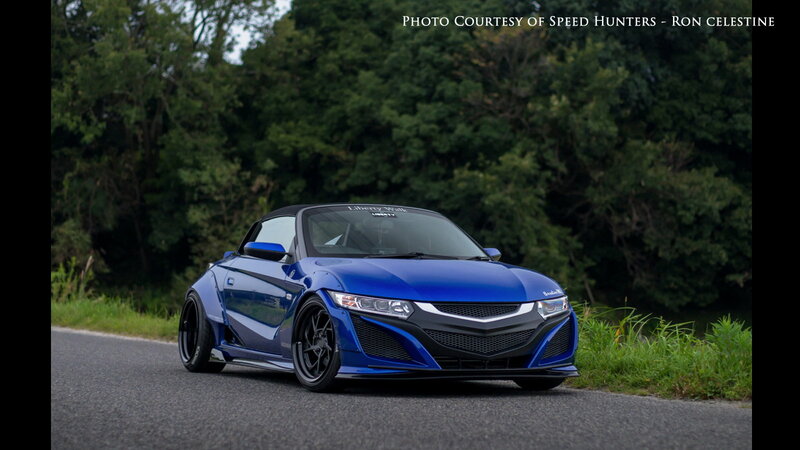 The custom forged 3-piece 16-inch wheels are a collaboration with Frontline, and shod with Yokohama Advan tires tuck nicely up under the wider fenders gives this sporty Honda the sticky ride you need to take sharp corners. Similar to the front, the rear bumper also borrows styling cues from the new generation NSX to help complete the look. 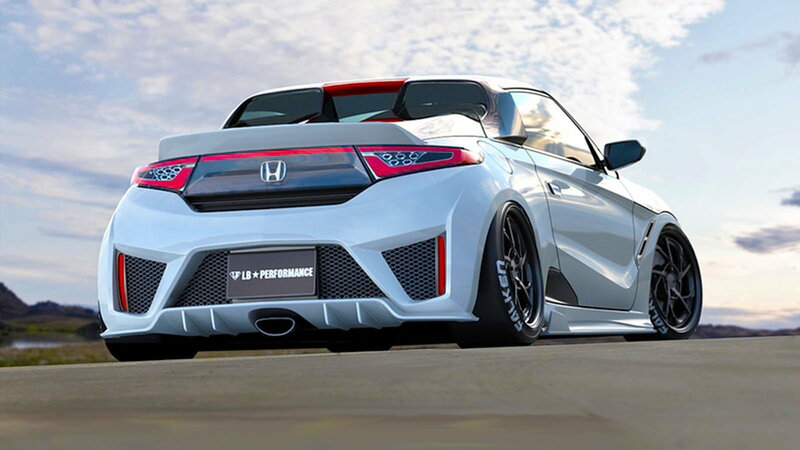 The ducktail spoiler alters the smooth curves of the S660’s original design, but it adds to the sporty look and is much better suited than an enormous GT wing which would probably tilt the lightweight front end up toward the skies. If you’re still looking for a little bit more performance and have some extra budget to burn, Liberty Walk can help out with the addition of an HKS turbocharger system to bring power figures into triple-digit territory. 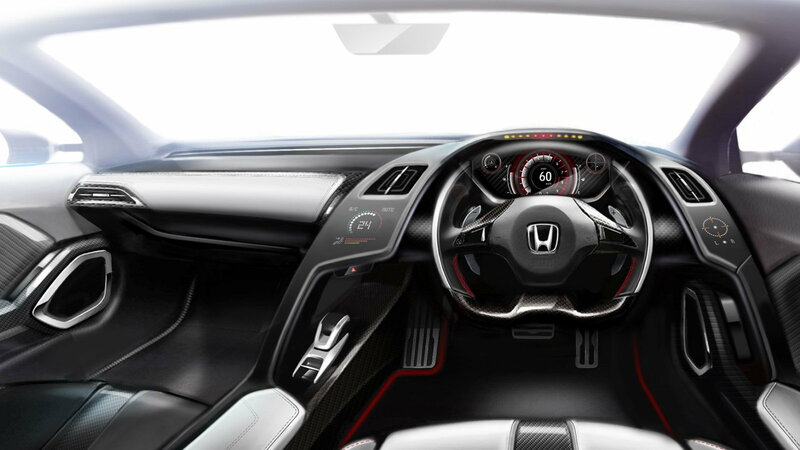 The interior cabin hasn’t changed much from the standard version out of Honda’s factory. Although a few accessories have been added, one thing can’t be changed: the space. So if you are not small, this is going to be hard to get into and out of and not the most comfortable ride of your life. The single cup holder can hold a 750ml bottle of water but that’s as big a drink as you will get. There is also no room for luggage. The only place to hold your gear is the passenger seat, and if you have a passenger, the only place to hold your gear is their lap… or someone else’s car. Compared to the Mazda MX-5 Miata, the S660 isn’t going to win the race from this stop light to the next one. But it’s not meant to either. But with the roof down and the slick gearbox, the sensation of speed will feel just as good as the actual speed of something faster. 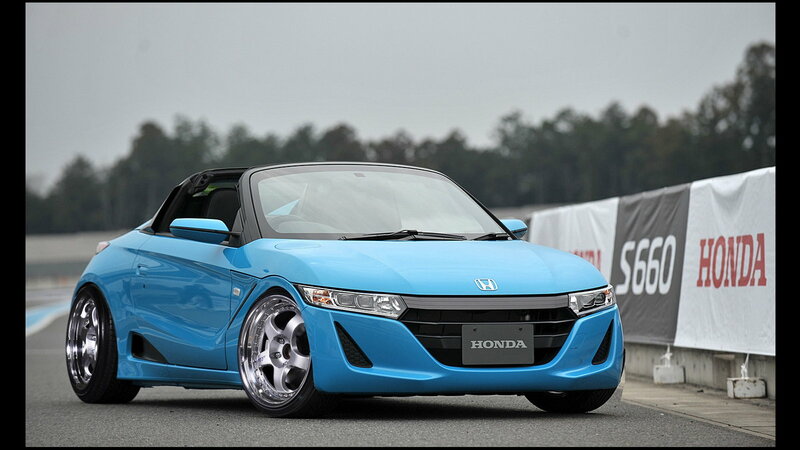 All size-related flaws aside, at roughly $20,000 new, the Honda S660 is the cheapest way to get into a brand new mid-engine turbocharged open-top sports car with a manual gearbox. If Kato-san gets ahold of yours, it’s going to cost you more, but from the looks of it, the changes are well worth the extra coin.